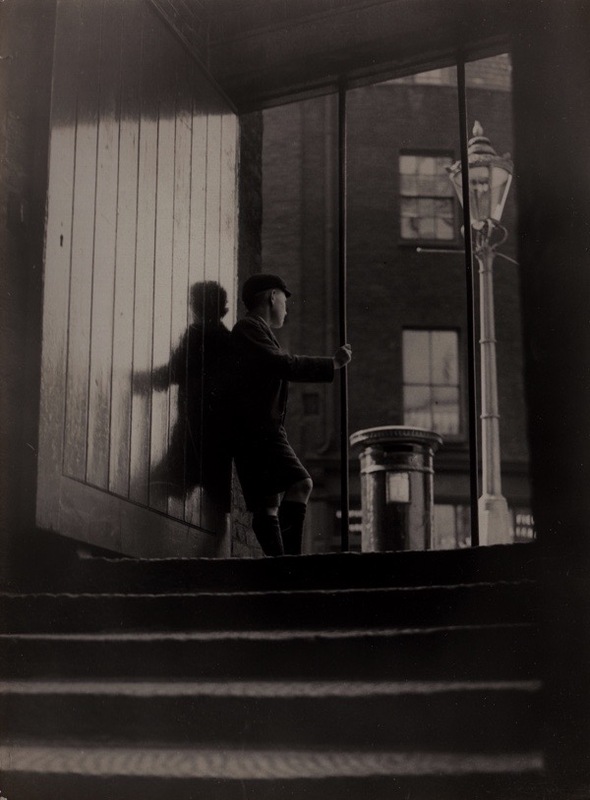 William Whiffin (1878-1957) is one of the great unsung London photographers, which makes it a rare pleasure to present this gallery of his pictures from the collection of his granddaughter Hellen Martin, many of which have never been published before. 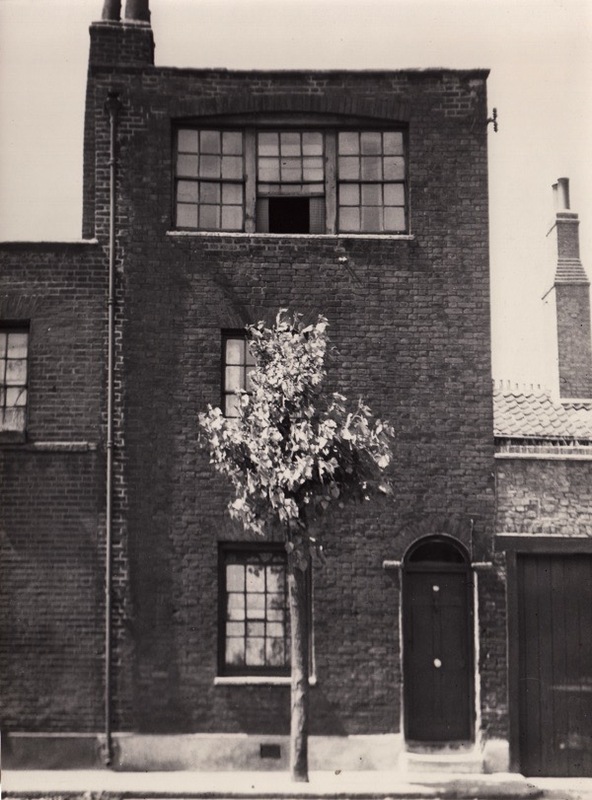 Born into a family of photographers in the East End, Whiffin made his living with studio portraits and commercial commissions, yet he strove to be recognised for his more artistic photography. 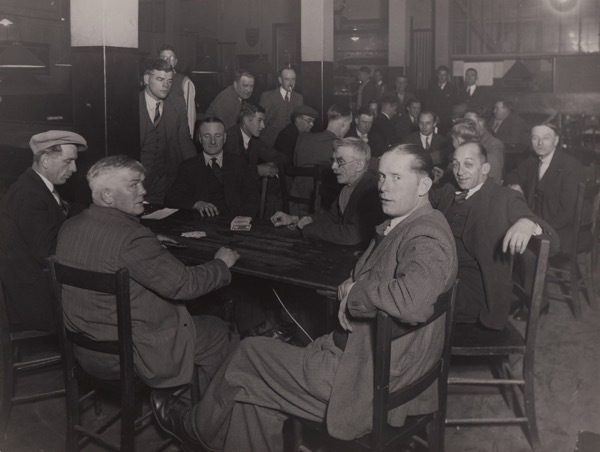 I recommend you visit the exhibition of William Whiffin’s East End at Tower Hamlets Local History Library & Archives until November 19th. I’m interested in this, last Saterday an organized walk took place in Poplar to visit some of the sights that Whiffin had taken photos of, I tried to book myself a place on the walk but unfortunately they wouldn’t let me join in ( I don’t know what I’ve done wrong ? ? ) so anyway, undetered, I did some research myself to identify some places around Poplar that Whiffin had taken pictures of and set out on my own (diss organized) walk to re visit as many of the sites as I could of the ones I had identified, I found it really quiet interesting to look at an area I’m very familiar with and yet see things in a very different perspective on account of Whiffins photos and because of this I began to see many aspects of the area that to my astonishment I had never noticed before, I thoroughly enjoyed myself, plus of course I had the added bonus of being guided around by the most charming guide (ME) who I am sure was far more entertaining than who ever was leading the OFICIAL tour ! ! Lovely photos. I wish I knew the stories that go with them. 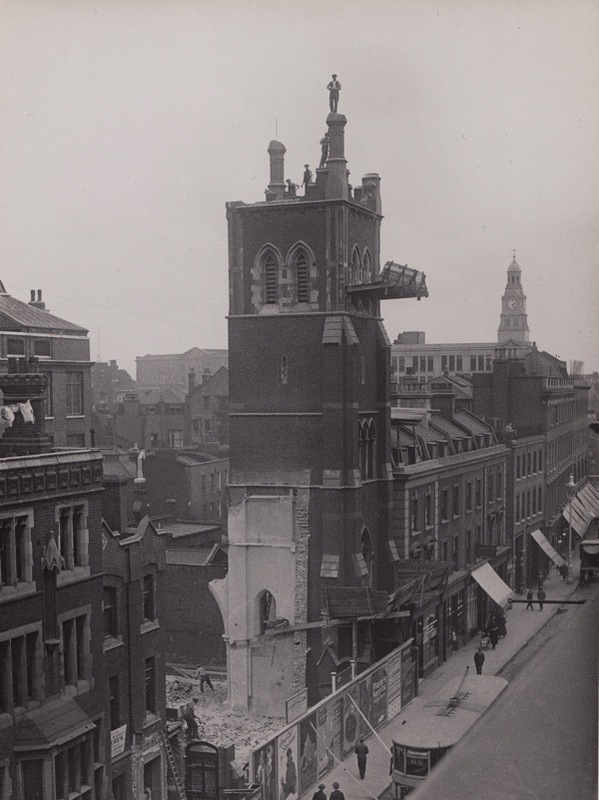 Gentle Author, a Google Image search identifies the church with the gent doing a jig on a chimney as St. Jude’s, Commercial St. 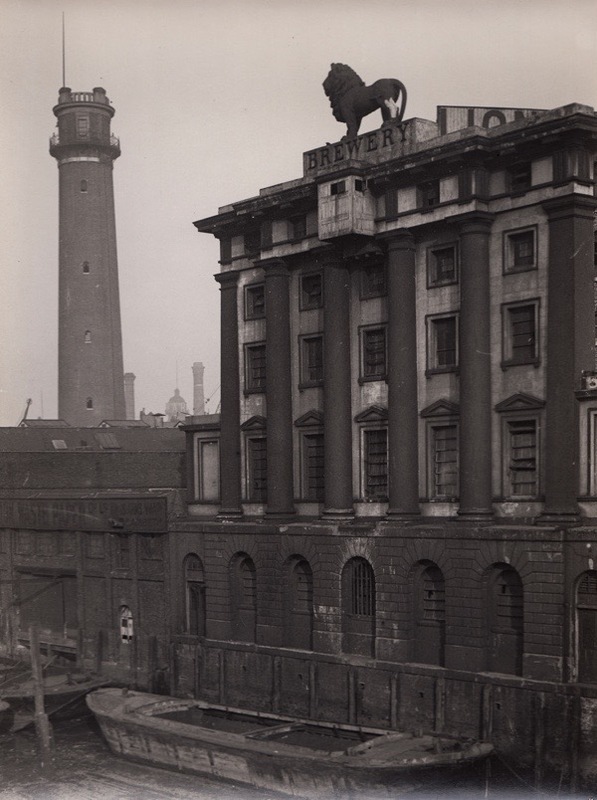 I remember the shot tower before it was demolished!In addition didnt the black lion get moved to the front of Waterloo Station & get painted red? 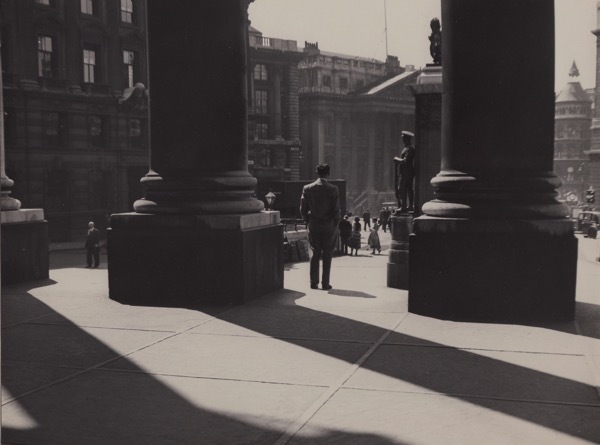 Fascinating pictures by an early street photographer. 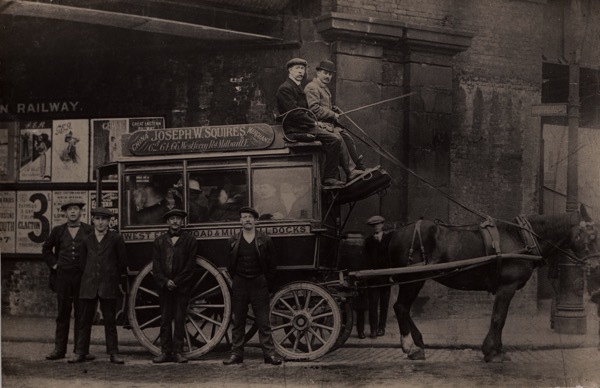 Judging by the tramlines and signposts in image no. 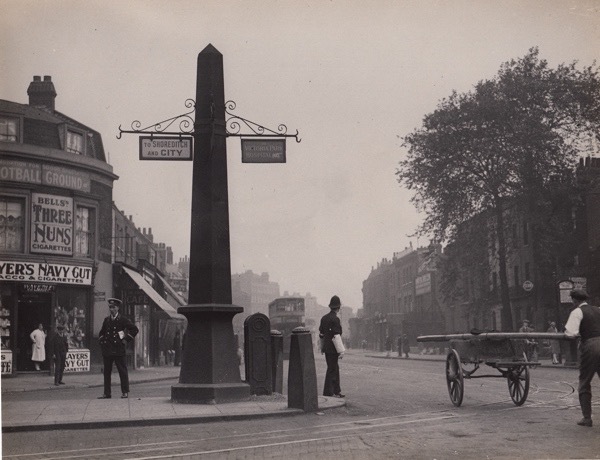 21, this is Cambridge Heath Road looking north, with Hackney Road running off to the left. 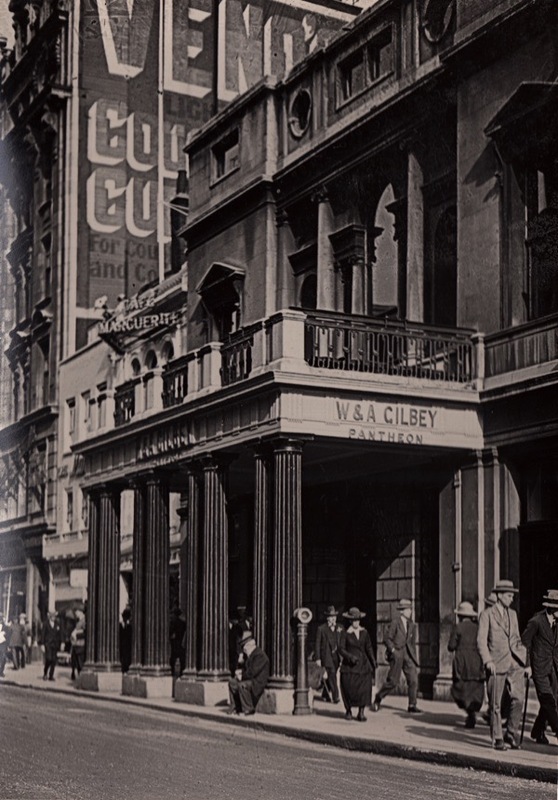 Brilliant view into past times. Thank you. Wonderful photos – thanks for publishing them on your blog. Must get to the exhibition. 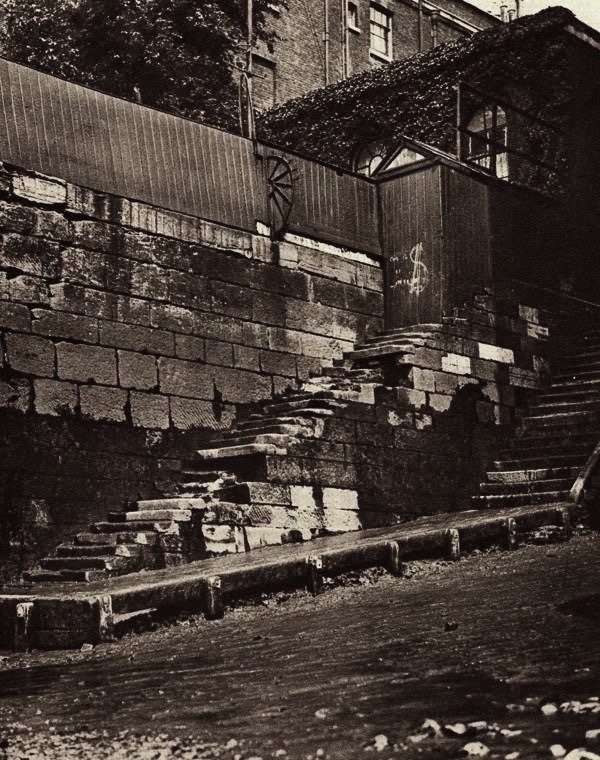 I think that the photo below Wapping Old Stairs might be of the junction of Hackney Rd and Cambridge Heath Rd looking north. 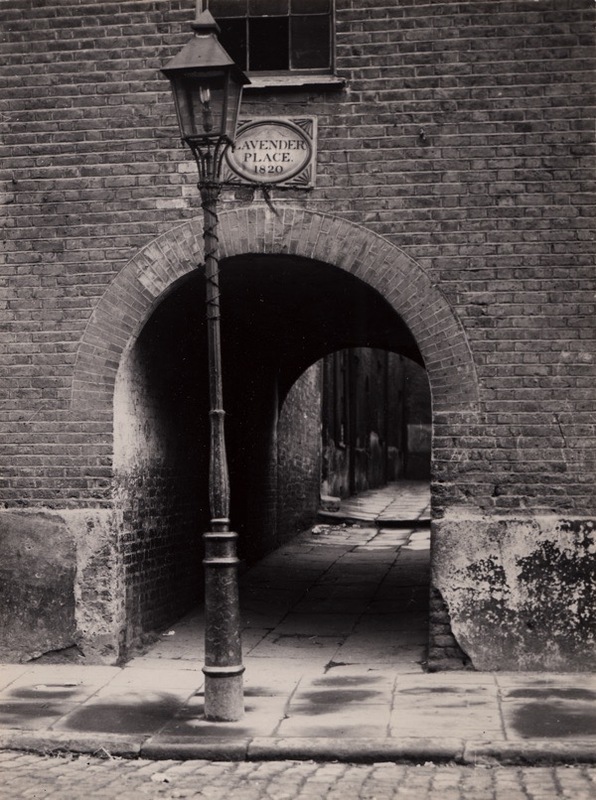 Clues for me are the signpost and that angle of the road going north towards Mare Street. 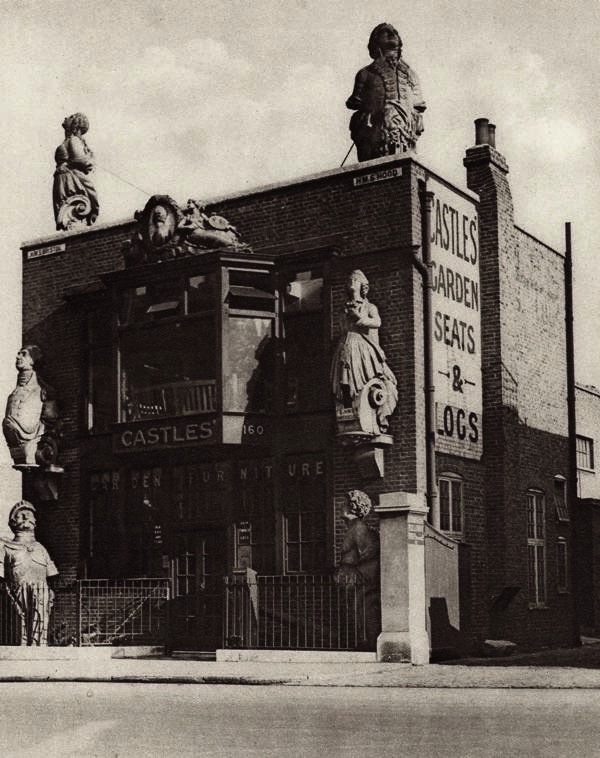 I’m a long time reader of your blog so was delighted to see the photo of Castles Ship Breaking Yard as it was started by my ancestor Henry Castle. Feel fee to contact me if you want further info. I’ll be going along to the exhibition. These cheered my heart no end! Mostly because, with a few exceptions, I haven’t seen these before. 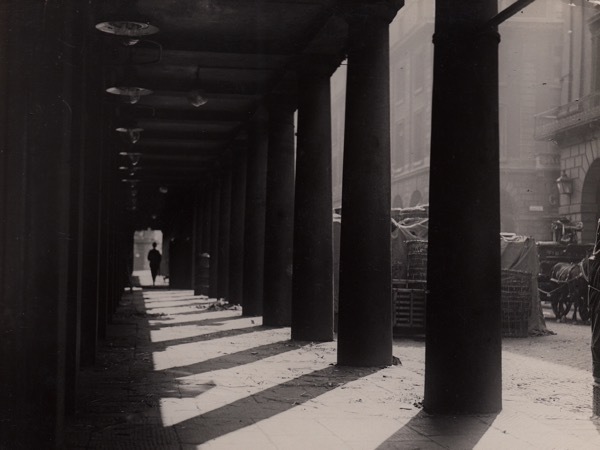 I love the scale of pre-war London, something that has been lost and looks set never to return. Much as I love London, I do not love a megalopolis. Well done, Mr Whiffin! 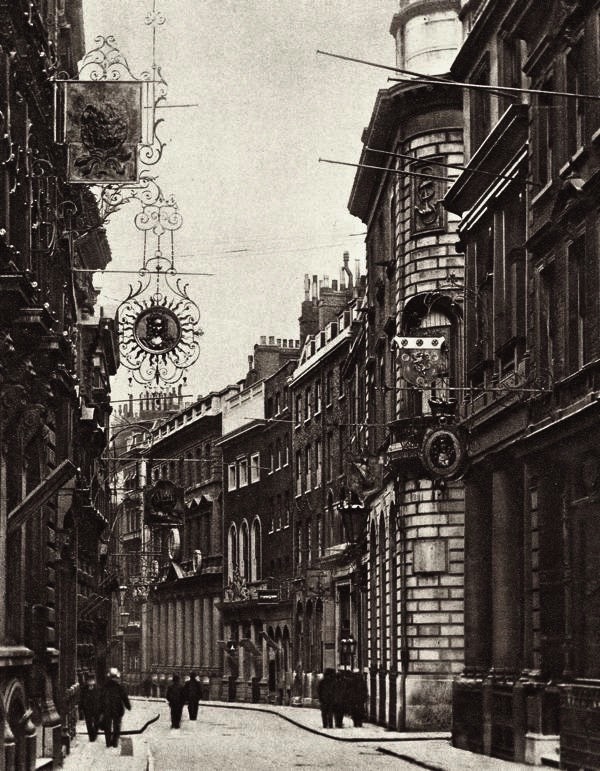 wonderful photos of London as it was. The farthing bundles must have been long ago – I had heard of (I think) penny bundles. Excellent photos, I did enjoy these. 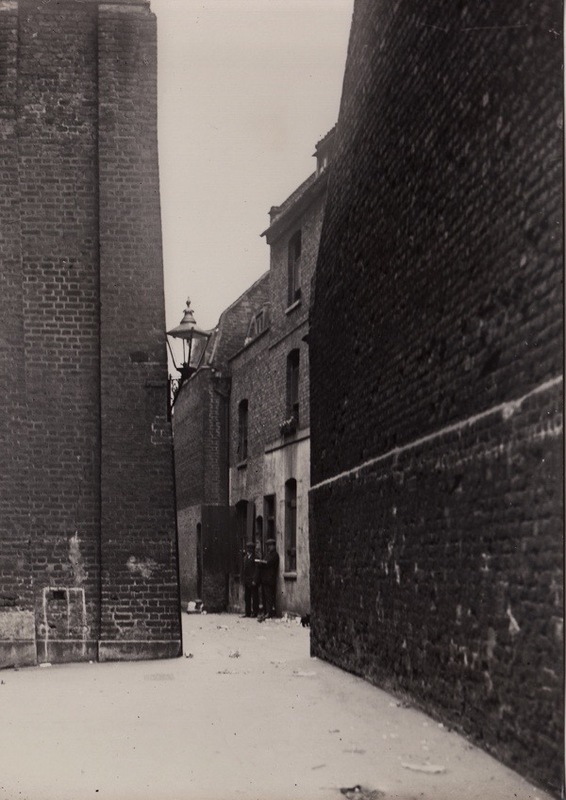 Richard – I too wondered where Lavender Place was and found it used to be in Wapping just to the east of, and parallel to, Chigwell Hill (which still exists). 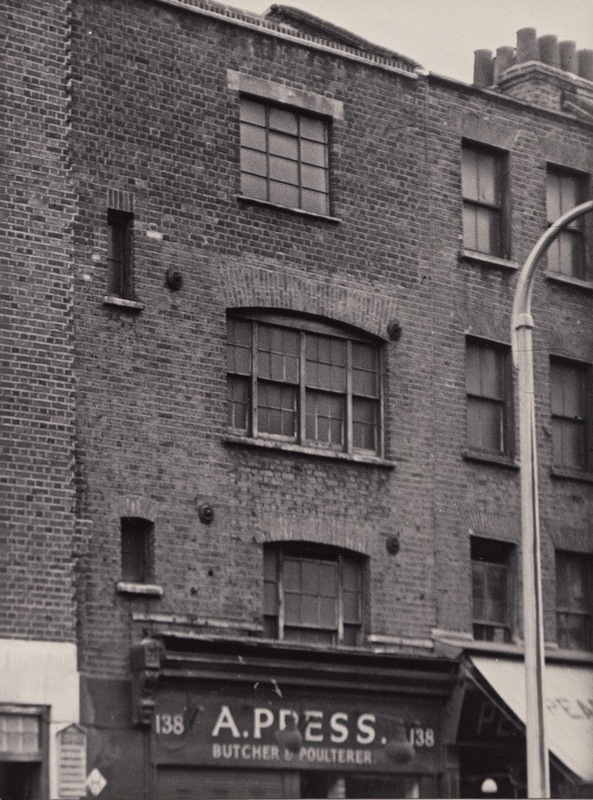 @Richard: Probably the Lavender Place that once ran off Pennington Street, Wapping. 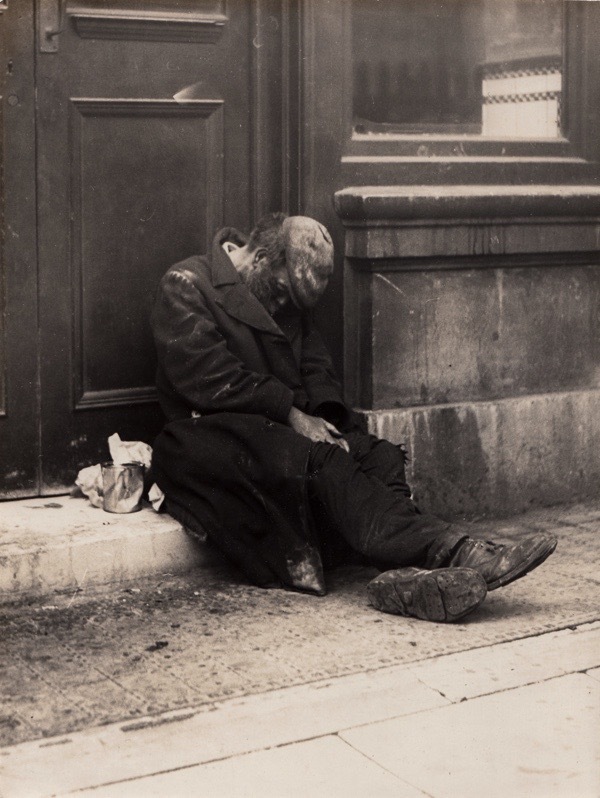 Thank you for posting these immensely evocative images. They conjure up a world that seems almost unimaginable now. What wonderful photos; such depth, so many stories – thank you for bringing them to our attention. Would love to see the exhibition; probably won’t be able to get to London before it closes but will make every effort . 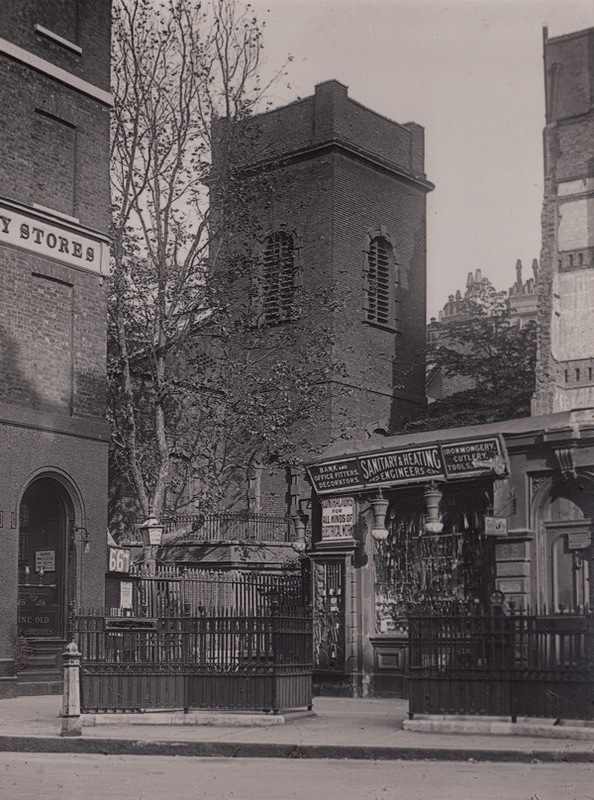 . .
Worth noting that St Jude’s was the parish of Revd Samuel Barnett – he and his wife Henrietta were notable social reformers and founders of Tornbee Hall. Barnett was vicar 1873-93. 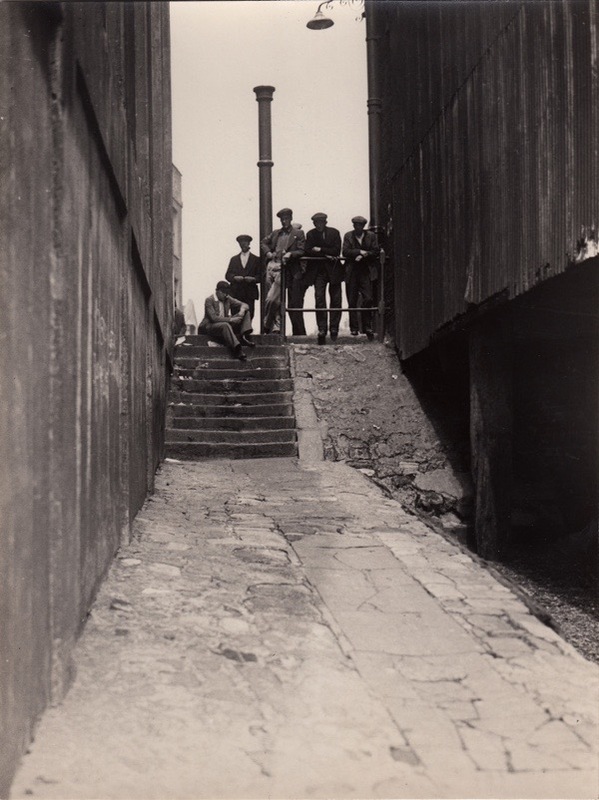 The church was closed in 1923 – presumably because the area was by then so largely Jewish. The ‘Version 2′ image — above the wonderful Faversham ‘Hopping’ Stiltwalkers — could in fact be (noting the curve of the river, the nature of the boat on the foreshore barge-bed, and what can be seen/worked out of the roofline of the waterside buildings) the shoreline view east from Free Trade Wharf to Limehouse Reach? 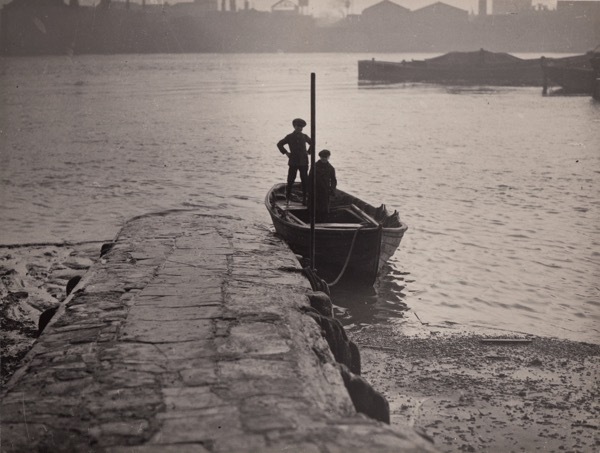 Think Whistler’s ‘Series of Sixteen Etchings on the Thames’, specifically his 1859 ‘The Free Trade Wharf in Ratcliffe’ …which certainly would have been available as inspiration to any Thames-inclined art photographer 50-75 years later. 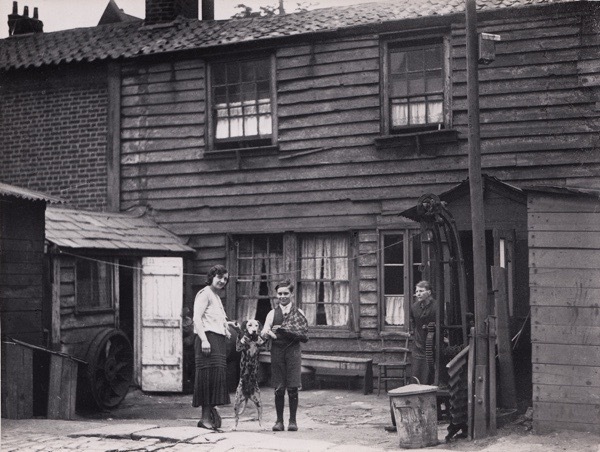 The wooden (lapstrake) house with the family and dog ouside, reminds me of the house I was brought-up in, although 20 miles down river: Blue Town, Isle-of-Sheppey. Some great photographs here, really in enjoyed them, thank you. Again a lovely blog. 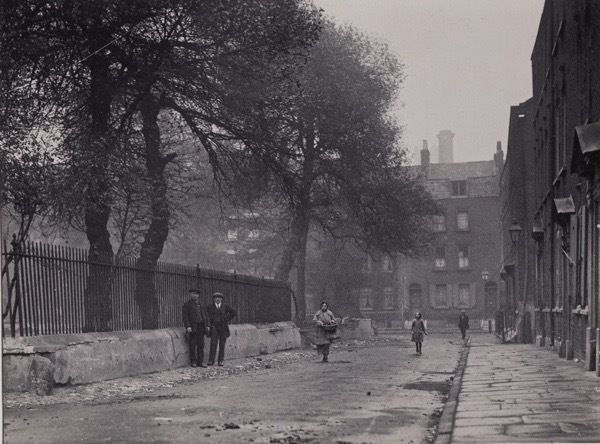 What thoughtful photos of a long-gone London. Being Californian, I had never heard of a farthing bundle and the name and the expectation on the children’s faces made me do some research. 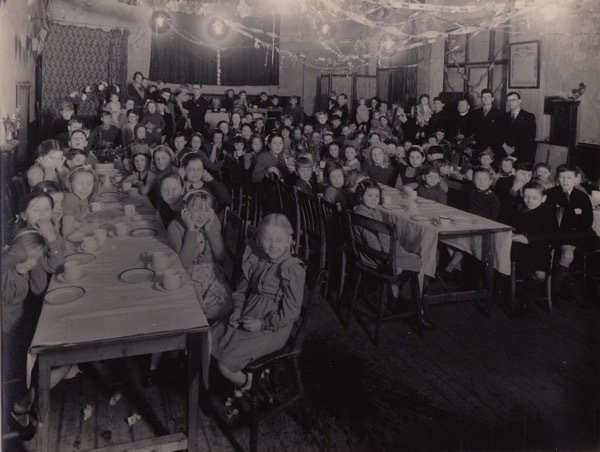 What a marvelous, heart-warming story of Clara Grant and The Fern Street Settlement. From my readings, I understand the Settlement is still doing good works. GA, your work did what a good article should do: it made me want to dig deeper into the stories you tell. Thank you as always. 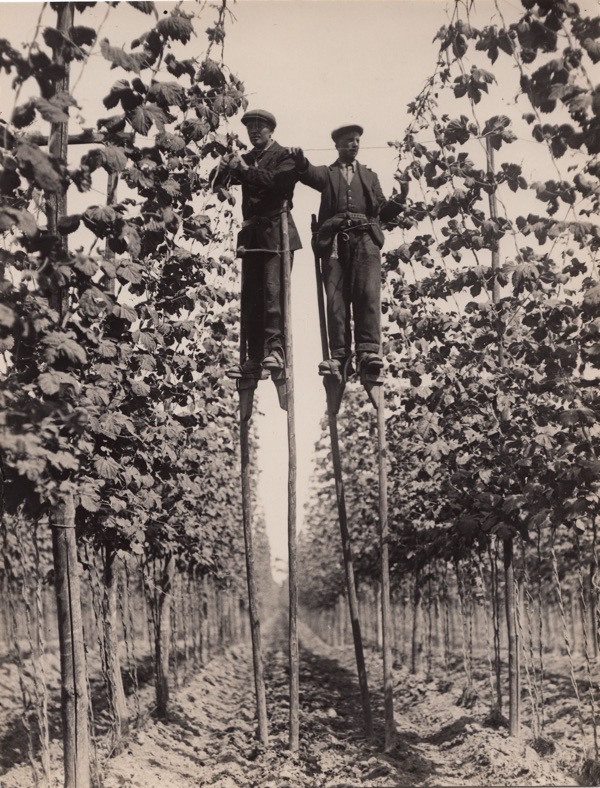 Fascinating – not least the hop pruners and the process by which they get up on the stilts and how they manage to negotiate the rough terrain. Thank you GA for another set of wonderful photos. 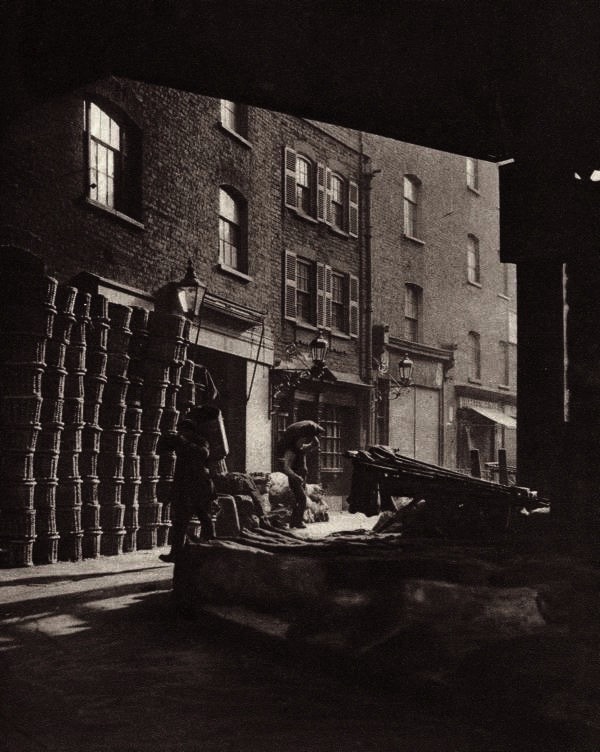 These are wonderful photographs, and so interesting to me as this would have been the London that my ancestors knew so well. I have never seen most of these views before so thank you so much GA.
Riveting! I ‘m going to get to the exhibition by hook or by crook. This lovely selection has convinced me. 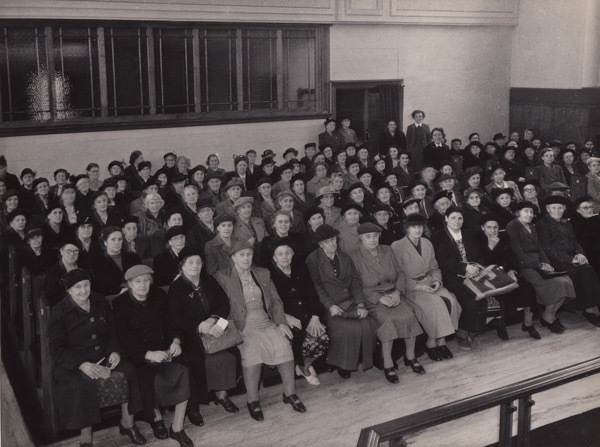 Intrigued by the untitled photograph of a large group of women at some kind of church or community gathering. 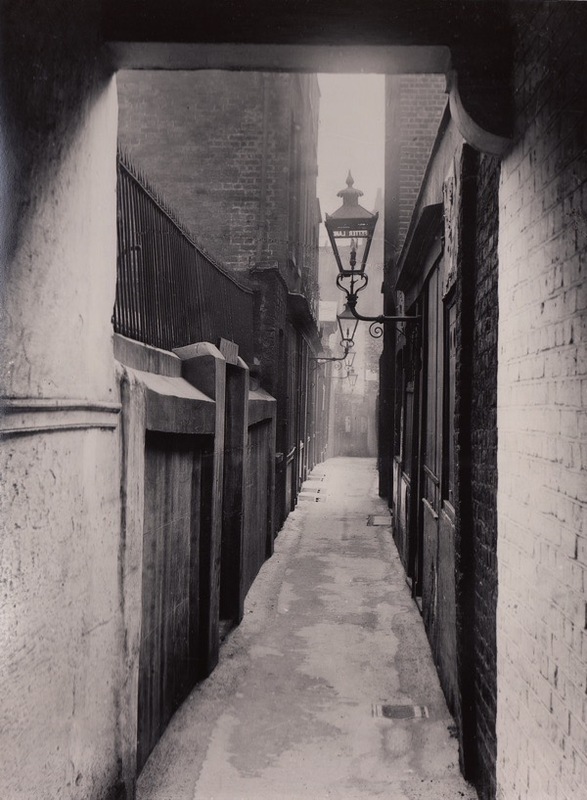 I am glad I came upon these great photos of a bygone London one that my mother inhabited. I am more interested because my mother has large beautiful portraits of herself and her mother taken by William Whiffen. They still hang in her living room. 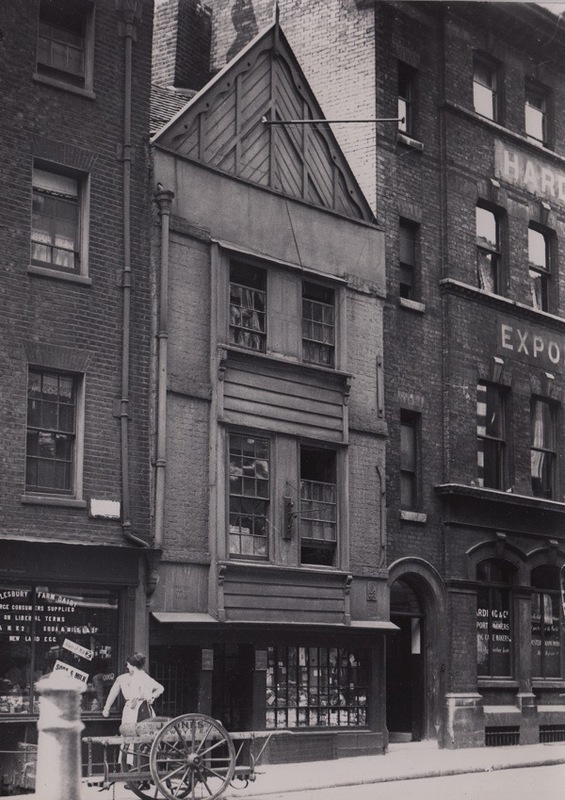 The photo of the little house with strange wooden gable at the front beneath the picture of Covent Garden is 7 Jewry Street. What a wonderful selection of photographs, thank you. 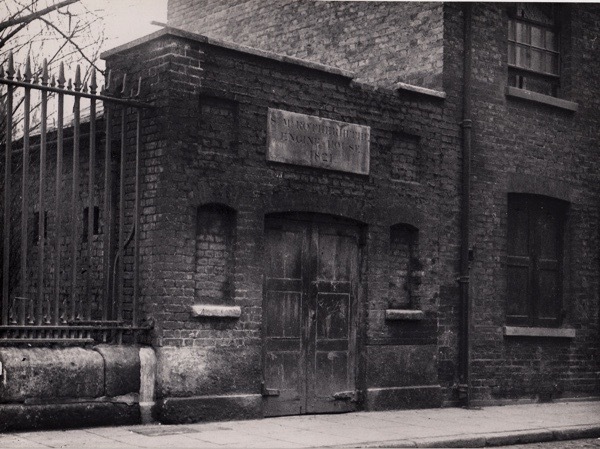 Re lion picture and Elizabeth’s comment – it was the Lion Brewery. The lion itself was only black through pollution. 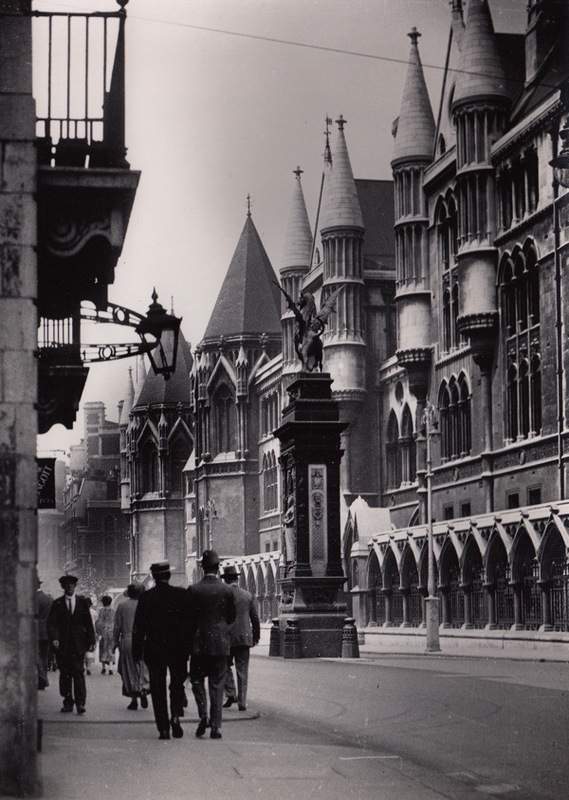 Yes, it was painted red and stood outside Waterloo for a time but then went back to its ‘Coade stone’ original white in 1966 and was erected at Westminster Bridge, where it still stands. These photos are absolutely wonderful. 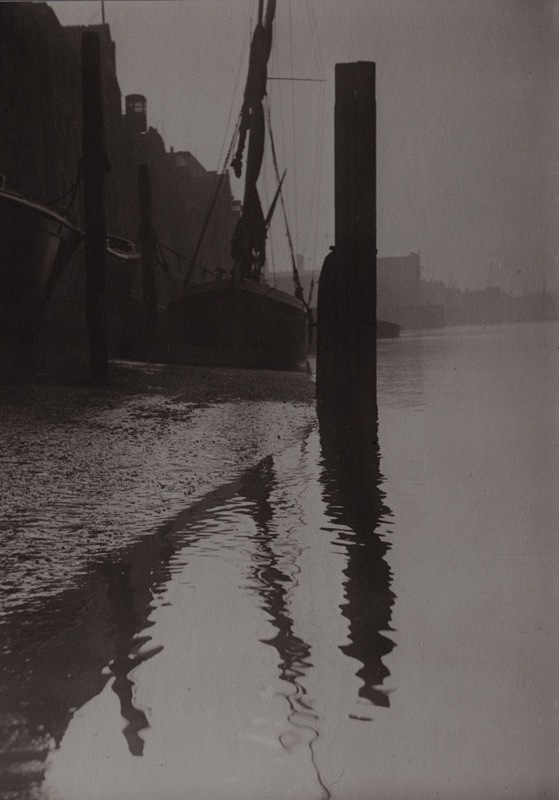 So evocative, so atmospheric. 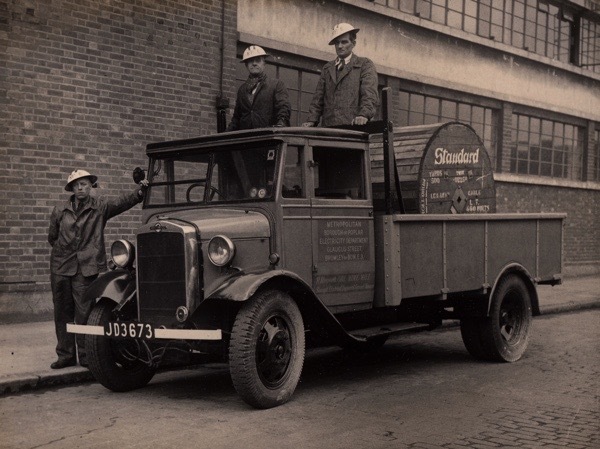 My maternal grandfather was born to a very poor family in Limehouse and my father was born just off Sidney Street, so the East End is my root – I’ve lived all my life in Ilford and Wanstead, and now I’m back near Ilford. I write books for families to explore free-to-see London and I just love walking around exploring and thinking. 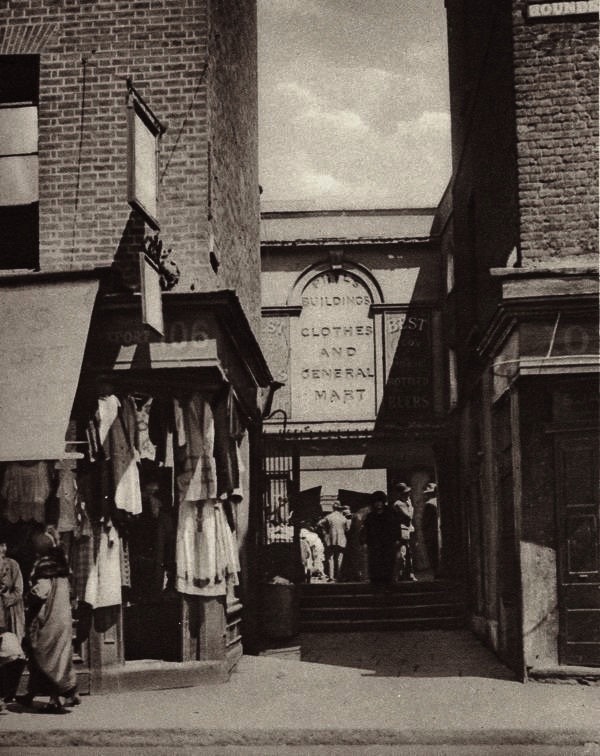 The East End has one of the richest and most interesting histories in our great city, yet further enriched with these photos. I will most definitely be going to the exhibition as soon as I can! Thank you. 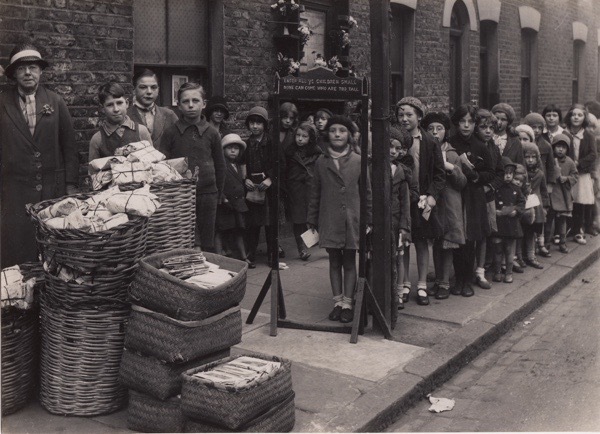 I found myself in the Whiffen photo of the Coronation street party in Southill St Poplar 1937,Iwas 3 and a half years old and I can still remember the day and Mr Whiffen ducking under the black cloth setting up his camera on the corner outside Boots chemists earlier in the day before the party for a shot of the opposite aspect,15 members of my family are in the picture which is outside my dad`s shop/warehouse which we lived above at No 32 which I believe became the ARP post B32.The cake on the table weighed 20lbs.The photo of the bomb damage is not of that location but the Kerby St right hand corner of Southill St as can be seen by the flank wall of the house which would have shown Boots shop window had it been so . Good old days.